I am a woman who enjoys writing down my prayers and thoughts in a journal. I get most inspired when I get my hands on a book that requires me to reflect on different parts of Scripture and write down what God is telling me. Reading this verse affirmed something in my heart that Jesus loves pure, uncluttered devotion. I knew that there is real danger for me to complicate this relationship by committing myself to a lot of spirit-building activities. There is nothing wrong with that, but I should not lose my focus on what really, truly matters to Him. I found delight in getting up early in the morning, brewing a hot cup of coffee and with two books (this one and the Bible) and a pen. Every day, I read one chapter of this Bible study and it pointed me to relevant Scripture for me to chew on. 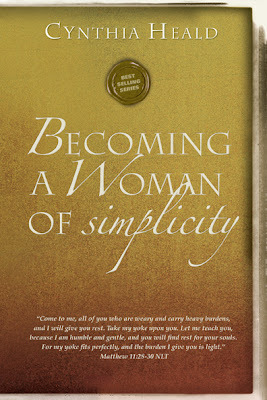 If you believe that you are a woman who needs to detox herself from all the activities that life demands, "Becoming a Woman of Simplicity" is a terrific book to lead you on a journey that will help you determine what is truly important in expressing your love for Christ. I concluded this study realizing that living a life of simplicity is not merely a choice I can make, but it is necessary in moving forward in my relationship with Him.